Date 23.03.2016 Australia has it all! The beaches, hot weather, beautiful landscapes, natural environment and laidback lifestyle. Most importantly, an excellent education system and countless job opportunities. Australia’s economic growth has made Australia one of the top destinations for migration from the UK. Here are some great reasons why. With a 5.8% unemployment rate which had recently fallen in the last month, Australia is undoubtedly one of the best places to secure a job. Tradesmen on the Skills Occupations List are especially in high demand in Australia, who are offered higher pay and more! Australia has countless naturally beautiful landscapes, such as the Great Barrier Reef and Whitsunday’s Islands. You can new kinds of adventure everyday travelling around! Living in Australia would be a dream come true! The warm weather, fresh air, endless activities to do, you’ll never get bored or be lost for new places to explore! Join sporting activities and music festivals! The best universities in Australia are recognised worldwide as being of a very high standard. In 2009, over 1 in 5 students studying in Australia were international students! Migrating with your children will mean giving them the best and everything the system has to offer. 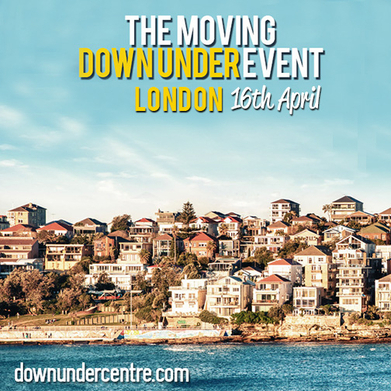 If you’re thinking about taking the leap and relocating to Oz, why not visit our migration event for, Moving Down Under, for more information on how to make your dream a reality. Held on the 16th April 2016, the Australian migration event will be targeting professionals from the Australian skilled occupation list, including those in Nursing and Healthcare, Construction, Trades, Engineers, Accountants, Recruitment, Digital Marketing and other sectors. The event provides the opportunity to have a one to one visa discussion with Immigration2oz and an employment talk with representatives of Hays Recruitment and Australia Nursing Agency. You’ll also get to speak to an international removal specialist PSS, talk skills with the Australian Government Approved Skills Assessing Bodies, talk finance with National Australia Bank (NAB), currency exchange experts Moneycorp and pension transfer specialists, Global QROPS, and meet experts from Bupa who’ve have been providing health cover for over 65 years. Don’t forget, you’ll be able to get loads of lifestyle and travel info from bbmlive.com and the Australia Work & Travel Guide to help your move down under.